In last post we discussed how to find xpaths in selenium webdriver, different functions and axes of xpath in selenium. (If you don't know how to find xpath, here is the complete guidline to find xpaths). Now In this post we will discuss, how to get values from web elements you already found using xpath. Sometimes you want to check the checkbox. You already have xpath for that checkbox. If you directly click on that checkbox it will get checked, but what if it was already checked ? it will get unchecked. So here, before clicking on check box, you need to know the value of check box whether it is checked or not. Other use cases are, getting value entered in text box for validation. Getting selected element from dropdown. 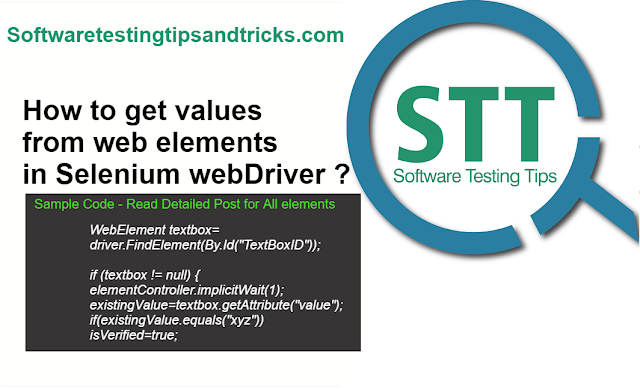 Let's see how to get those values from web-elements in selenium webdriver. I am writing my scripts in Java. Here, getAttribute("value") Will return the value of that text box. Sometime people ended up using method webelement.text which most of time fails as it returns inner html of that webelement. getFirstSelectedOption() will return the xpath of first element (which is selected) and getText() will give you the text of that element which you can check. Here when check box is checked then class getting changed to checkbox-checked. So checkbox, dropdown (multilist) and check box are essential elements. When you want to verify forms or something similar then getting there values are very important. Same way you can get the value of Radio Buttons (true or false) . Hope this article helped you. For any query you can comment, mail us. Please do subscribe with email to get updated articles in your mailbox. Follow on social media and share this article. What is selenium? How selenium works ?